Kitchen : This big biscuit with chocolate chips hides a delightful surprise in the center of it, yum! 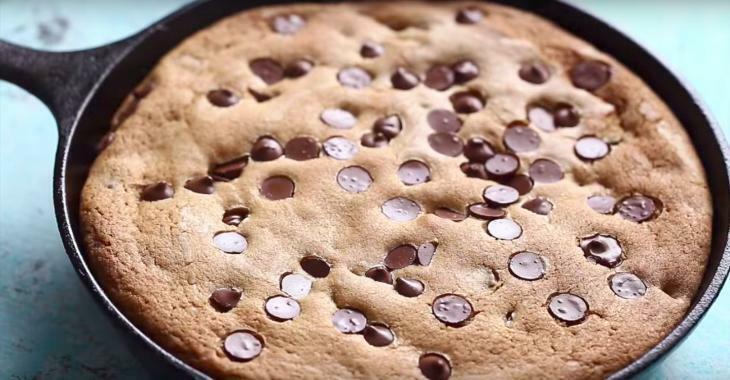 This big biscuit with chocolate chips hides a delightful surprise in the center of it, yum! This big biscuit looks great, doesn't it? Personally, I love chocolate chip cookies, it's a classic! Preheat the oven to 350°F. Grease a 9-inch cast iron pan (or pie dish) and set aside. Mix the butter, brown sugar, sugar and vanilla in a bowl. Whisk until light and creamy. Add the egg and whisk again for 2 minutes. In a small bowl, combine flour, baking soda and salt together. Pour into the wet mixture and stir using a rubber spatula. Do not stir too much! Fold half of the chocolate chips and spread half the dough in the prepared pan. Spread the melted nutella evenly over the cookie dough in the skillet 1 inch from the rim. Add the remaining cookie dough and smooth with the back of a spoon or spatula. Bake for 28-30 minutes for a melting cookie or, after 30 minutes, cover the pan with foil and bake 10 more minutes for a dry biscuit. When I get friends for diner, I make this dessert and I put it directly on the table. Everyone loves it! !